Each Brew Keg fermenter is capable of brewing 2 gallons of fresh, top-quality beer per batch Brew keg is made from Advanced Rez-Tech Poly Vinyl Chloride, an FDA compliant plastic which imparts no taste or flavor migration, is lightweight, and shatter resistant. 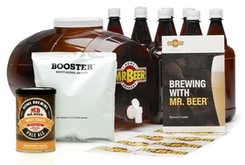 Mr.Beer Brew Packs contain everything you need to brew another 2 gallons of great-tasting beer. Whether you like light beer or dark beer, American favorites or International classics, there is a Brew Pack for you.